The first post-Paris climate conference – held in Marrakech, Morocco, from November 7-18 – promised to make headway on devising a means to implement the Paris Agreement. 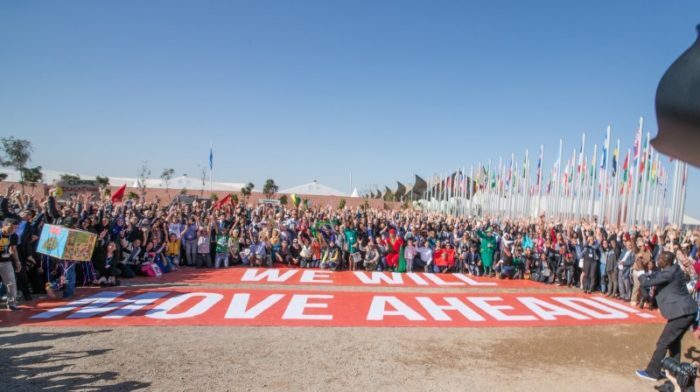 Hopes were high for these talks, dubbed ‘Action CoP’, to make progress but just into the first week both delegates and observers were sideswiped by arch-climate sceptic Donald Trump winning the US presidency and the anticipated negative impact this would have on global climate action. But whatever promises or threats Trump ultimately keeps with regard to the environment, it’s clear that international efforts to combat climate change will move ahead anyway – the Paris Agreement is now officially in force, with 112 parties ratifying it in record time, plus last month’s historic adoption of the Kigali Amendment to phase down the use of super warming hydrofluorocarbons (HFCs) under the Montreal Protocol marks another important milestone. The Paris ‘rulebook’ (or the nuts and bolts of the Paris Agreement) now has a deadline for coming to fruition. Parties have until December 2018 to agree on rules and processes enabling the deal to be put into effect with regards to tracking and measuring progress in relation to their nationally determined contributions (NDCs) as well as ensuring transparency and accountability regarding finance, capacity-building and technology transfer. Parties discussed in Morocco how to ensure consistency and comparability across the multitude of features in countries’ NDC submissions. Informal consultations point towards parties’ widely divergent views as some prefer to retain only the broad NDC features articulated in the Paris Agreement for the next set of NDC submissions while others recognise the need for further elaboration and mainstreaming. Preparations began in Morocco for the first global stocktake of countries’ collective efforts to reduce emissions under the Paris Agreement. The stocktake will take place in 2023 and every five years thereafter, with a pilot phase in 2018. At present, efforts are far from what is needed to hold global average temperature at 1.5°C above pre-industrial levels, and scaling up ambition from all countries is urgently needed – UNEP’s 2016 Emissions Gap Report tells us we are currently on track for up to 3.4°C warming and unless parties scale up their emission-reduction pledges urgently, the door to averting climate disaster might close in as few as three years. Under the Paris Agreement, parties were invited to submit by 2020 their mid-century decarbonisation plans to the UNFCCC secretariat. Canada, USA, Mexico and Germany have already done so during CoP22. It is hoped more countries will embark in the process of devising long-term decarbonisation plans. Furthermore, in Morocco, a coalition of 47 most climate-vulnerable nations issued a political declaration pledging to achieve climate neutrality by 2050, to prepare their mid-century strategies as early as possible and to achieve 100 per cent domestic renewable energy production as soon as feasible. Trumping climate action? Not so much! During the first week of negotiations, it was plain to see the impact of the Trump’s election win on the faces of delegates and observers. But as talks continued, Morocco’s CoP22 president Salaheddine Mezouar and Fiji Prime Minister Frank Bainimarama, who will preside over CoP23 talks in Bonn next year, broke the silence to plead for the US president elect to take climate change seriously and uphold international commitments. Chinese leader Xi Jinping underlined the importance of US and Chinese cooperation, while adding his country will continue to fight climate change regardless of circumstances. Most green groups present rightly pointed to the tangible progress all countries made to secure the Paris Agreement and that significant action on the ground is already underway in all parts of the world – and will continue despite Trump’s victory. Read EIA’s briefing to CoP 22 here.